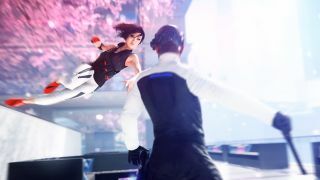 Mirror's Edge Catalyst won't be officially released until June 7, but EA Access subscribers can go for a nice long freerun with Faith five days earlier. The Origin Access site (which is the PC equivalent of the Xbox-One-exclusive EA Access program) reveals that members will get to start a Play First Trial beginning on June 2, allowing for six hours of play. That's actually a little bit less time than the 10-hour Play First Trials for Need for Speed and Plants vs. Zombies: Garden Warfare 2. It sounds like Mirror's Edge Catalyst is more single-player campaign focused than either of those games, so it makes sense that EA wouldn't want players burning through too much of it before they actually buy the game. Like all of EA Access' free trials, your progress will carry over if and when you choose to purchase the full version. Speaking of early releases, Mirror's Edge Catalyst would be coming out tomorrow if EA hadn't delayed it by two weeks to address player feedback. At least you can listen to the new theme song by CHVRCHES while you wait to get started on Faith's origin story.